In January 2014 I was at the peak of my career, and having the most fun I’ve had in a job since… I don’t know when. I had finally found my niche. I was experiencing great success not only in pre-sales, but Oracle-wide as an advocate for re-imagining corporate decks. With exciting opportunities on the horizon, I dropped the news that I was leaving Oracle. Why leave when what looked to be the perfect set was approaching? 2014 was set to be a Mavericks year for me. Instead of paddling into that wave, I broke away and paddled to a completely different beach. I had no intentions of leaving, but I left the best job of my life. The Apple G4 Dual happened. January 2002! A memory of a feeling that deeply affected my outlook and perspective on my work. I remembered the first time I opened my Apple G4 Dual. I was mesmerized by even the process of opening the box! I stopped at each stage as I was transfixed by the beauty, design and attention to detail. I took pictures and savored each and every moment. I felt something special, even magical at that time. The experience affected me. The little things did matter. The fonts matter. The weight of the fonts matter. The position of the fonts matter. These things began to matter to me just as much as the message. I would never be the same again. In January 2014, I saw a product that reminded me of those same feelings I experienced back in 2002. Incorta gave me the opportunity to design not only the user experience of the application, but design how the product is experienced. To be given the chance to create an experience from the ground up. To create a culture around some of my experiences, thoughts, and ideas. The possibility to create not just interesting slides, but to re-think how we do sales and the entire user experience from beginning to end. I get to answer the questions such as “How do we best serve our future brand fanatics? How do we help them actually enjoy going through an enterprise software selection process?” For too long business software vendors have fed us the lie that enterprise shouldn’t look and feel like consumer software. Function and features are all that matter. Somewhere along the line we forgot that B2B was really just H2H (Human to Human). We lost that human touch. The balance sheet was all that mattered, and the balance sheet didn’t care about the font. So many companies don’t get this. “There is no more B2B or B2C. It’s H2H: Human to Human”. I get to design the whole ownership experience which begins with your first impression of Incorta all the way down to the… well actually, it never ends. I want to create a product you don’t want to put down. A product you want to touch, hold, and savor. And that’s just when you are reviewing the Non Disclosure Agreement. Have you had an Apple G4 Dual moment? If so what was it and how has it changed you? Photo Credit: Coast Guard photo by Petty Officer 3rd Class Adam Stanton. Presentations have to be focused on the audience and not self-serving. No surprises there right? You wouldn’t expect anything else from me? Quite frankly that doesn’t go far enough! I am a firm believer that you should place your audience above your co-workers, boss or anyone from your company. This might sound like common sense but reality can be a lot tougher than throwing out pithy sentiments. Are you prepared to stand up for what is right for your customer, audience, or future advocate? How about before you even begin creating your presentation? Great presentations start before the presentation is crafted. Understanding the true purpose is crucial to any meaningful presentation for your audience. I recently faced the challenge of “the rubber hitting the road” on this very issue. I was asked to present material that co-workers requested which I believed was self-serving and not in the best interests of my customer. I was challenged to follow my own convictions, beliefs, and opinions on what was truly valuable to the people that really count: the audience. Thankfully, I am no longer afraid to speak up even if it offends people in order to do the right thing. I personally don’t care who you are. I won’t go against my convictions and fail to stand up for the customers best interest even in the software selection sales process. I view myself as a guide for buyers inside of the software selection process. I want potential customers to make well informed decisions. I have no interest in exploiting an opportunity to sell. I want to hold up my head with pride in 2-3 years when I walk back into that same company. The most valuable commodity I have is my credibility. I don’t plan on devaluing that currency. Next time you create a presentation, make sure it’s truly for the primary audience. Don’t try to impress your co-workers, boss or anyone else. Knock the socks off the audience with a presentation that gives them everything they want and more. They will thank you! Any company worth its salt will appreciate that quality in you. If they don’t, you’re in the wrong place. Don’t be afraid, move on to a new opportunity where Leaders Eat Last. They will provide you with a safe place to take risks, delight your customers, excite your audience, and hold your future advocates above that of any political corporate game. 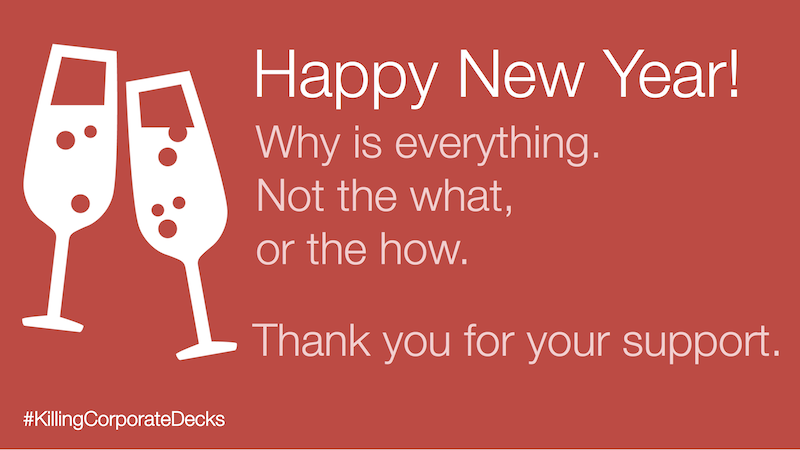 Now raise your glasses and toast to creating some truly breathtaking presentations in 2014. Let’s turn the tide this year and make progress towards #KillingCorporateDecks. I despise those words. #DESPISE. It took me a whole week to write more than that opening sentence. Despise captured my feelings and frustration towards the idea: that my value can be sent over e-mail. The implication that my presentation value can be captured in a PowerPoint deck irritates me no end. If that was the case, there would be no need to have me here in person. My communication would be pure and simply one directional. Spewing forth information about how wonderful our products are, and they are wonderful, believe me, or if not me, believe our advocates (customers). My presentation is not my deck. I am the presentation. I present. The slide deck doesn’t present! Stop and think for a moment. When did you last ask someone to reduce 80% of their presentation to a slide deck? It’s criminal in my mind. You think I am being too strong? Well bear with me. I’ll make my case. Think about what you are really saying when you ask someone to send their presentation ahead of time for you to review? The statement is quite ludicrous. It’s patronizing. How do I send myself over e-mail? My presentation is not my deck. I am the presentation. I present. The slide deck doesn’t present! It’s a visual aid. I strive with my presentations and slide decks (yes they are not the same thing) to avoid beating you to death with boredom. I’m not delivering a white paper as my illustration. I am seeking to engage with you and share something I believe to be immensely important to you. If I don’t convey my message clearly I have done a massive disservice to you. I have failed you. I have wasted your time and reduced myself to being left out in the cold (see my “Are You The Best Leading Role, Supporting Role, An Extra or Left Out In the Cold?” post for more on this). This is something that I cannot afford to do. The cost for you to not hear my message will be detrimental to your business, your story and your success. If I don’t believe that, I am in the wrong job. I need to quit. I need to find a message and company I do believe in. The story has to be bigger than just me pedaling some software. So how on earth can I dissolve all of the nuances that go into my presentation and send them in a PowerPoint file? Quite simply I cannot. So I don’t. I refuse (as much as I can). I get people annoyed because they all want and expect the slide decks. Really though, how useful are the slide decks you’ve requested? Do you give it one surface glance and then never look at it again? I know I’ve done that countless times. The only exception is when you are asked to give that same presentation (this crime will be the subject of a future post). These bullet laden documents are worthless as handouts or leave behinds. They don’t convey the full story. They certainly destroy the story or leave it open to misinterpretation. Most presentations are lousy documents that I can’t read and understand in isolation. They are also equally lousy presentation material as visual aids. Somewhere along the line we went for a hybrid model and found ourselves in the sad mess we find today. It wasn’t always this way. Before PowerPoint it wasn’t really possible to have so much text on our visual aids. We used white boards. It was concise. Relevant. To the point. Then we let technology get in the way of telling a good story. This hybrid of a handout and visual aid doesn’t deliver on either of its intended purposes. I maintain we need both. The visual aid and the handout. It reminds me of the Windows 8 OS. Is it a tablet OS or a Laptop OS? It’s a miserable hybrid of the two. And from how the market is responding a lack luster attempt at hitting the nail on the head for either purposes. This is where I expect a lot of opposition. Why? What I am about to suggest takes time and effort. It’s the right thing to do to stand apart, to bring value to your audience. Two documents. Yes, two documents. Your slide deck and a handout / leave behind. Trust me this will make a difference and ensure as much as possible your message gets across to those who were not present (or wish to review ahead of time). Of course if you can afford a film crew and make a quality video and post-production for embedding slide content I would go for that approach. Even that is not ideal. The presentation handout if requested is always appreciated by the audience. Do not merge the handout and the slide to be one. That’s a mistake. Resist it at all costs. They need to be two distinct deliverables. To have your talk track on screen is a mistake. To send out a visual aid slide deck with no talk track is a mistake. Embed your slides into your handout and then have full written sentences that explain the message which the slide illustrates. It’s hard work. It pays off. Are You The Best Leading Role, Supporting Role, An Extra or Left Out In the Cold? The presentation is not about you. The audience should be the focus of the presentation, unless you are some egotistical maniac. It’s really their story – you need to figure out how you fit in as a member of the cast. You are not the leading role; you’re purely a potential supporting role. The sooner you come to terms with that the more successful you will be in connecting with your customer. Yes, yes, you’re special. Of course you are a snowflake. One of a kind. Very special. You know cause your mom told you right? Well I’m sorry to burst that bubble. Realize that approaching your audience to talk all about yourself is obnoxious. It quite frankly doesn’t work. Let’s face it. No one is coming to listen to you because you are U2, The Black Keys or The Civil Wars. They come to listen to you because you have something that might benefit their story. Simply put, your story is of no interest to them. Get over yourself. Face the truth and change. The only other option is to be irrelevant and left behind. When you present to an audience, your audience is actually assessing whether you are a key supporting role, an extra or just getting in the way of a good story. This is an audition. The future advocate (old term prospect) wants to see if you play a role in their story. They are not interested in being an extra in your story. They don’t care how amazing your product, your slides, your jokes are. Start with your customer. Start with understanding them. Know their story, how else can you show how you fit into their story. So now while you are coming to terms with the cold reality that you’re not that important, go and listen to one of my favorite bands of all time. The Civil Wars. #ToughLove.